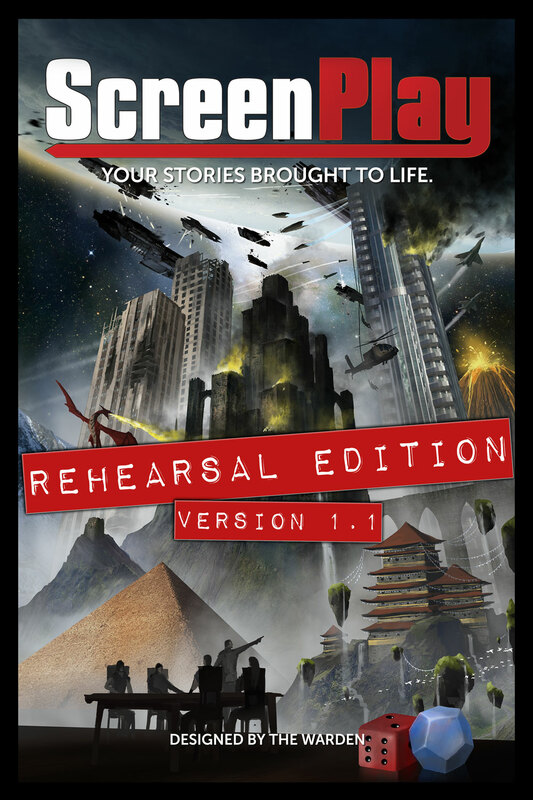 Now work progresses on taking ScreenPlay to the next level and after careful consideration, we’re turning to the public once more to make its official launch bigger than ever. Yep, we’re crowdfunding it! (Either Kickstarter or Indiegogo are on the table and a final decision has not yet been made.) The response from playtesters has been fantastic and it feels right to try and give this game a fighting chance to rocket out of the gate with more than our original plans. Expectations are to launch the campaign in Spring of this year and we’re working on building up some stretch goals to make the offer even sweeter than ever. 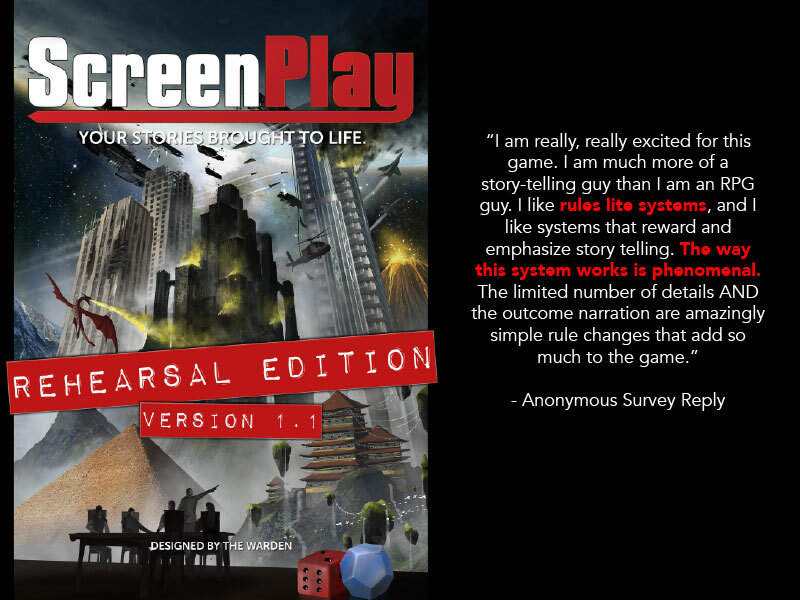 If this sounds like your cup of tea (or coffee), stay up to date right here on brokenrulergames.net or through the ScreenPlayers Guild. An actual photo of an actual game of ScreenPlay in progress. Every game designer’s dream come true. They say, “Be careful what you wish for.” Then again, sometimes you get exactly what you were hoping for in the craziest way possible. 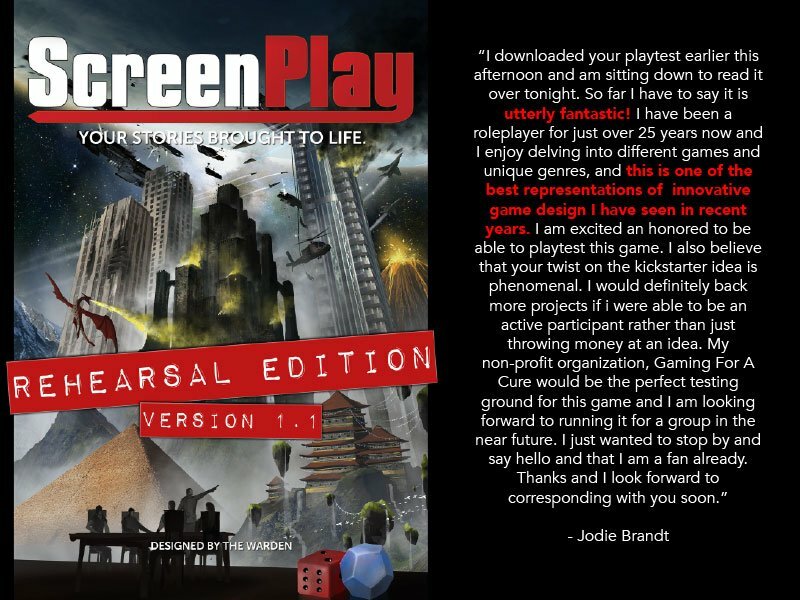 This past Thursday, I had the pleasure of running a ScreenPlay demo in a downtown Ottawa pub for six players, including ENnie Award winner, Jason Pitre (Spark, Posthuman Pathways). This was part of Cardboard Kingdom’s #beersnboardgames night and a big thanks to Kat for helping to set this up. Rather than walk into this demo with a preconceived treatment or genre in mind, I wanted to see how the game would hold up against any possibility and have the Writers devise the genre, setting, plot, everything. Let the chips (and dice) fall where they may. 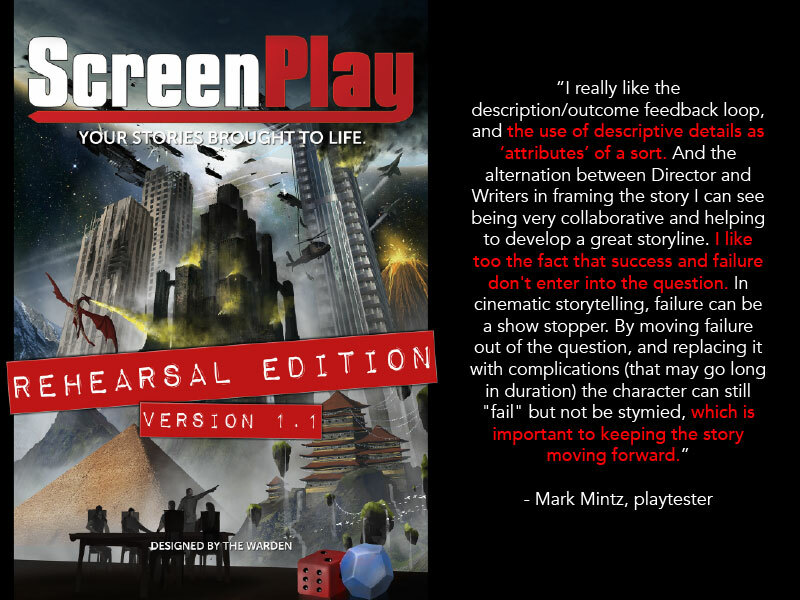 What I did not count on was an experienced bunch of story gamers who love to let the mayhem fly when the GM doesn’t clip their wings and while it initially sent a wave of panic through my chest, it ended up being the greatest game of ScreenPlay to date. Here’s what they came up with: a deep space romantic reality show (akin to The Bachelorette) where aliens of all genders attempt to win the affection of Captain Kirk’s preserved head in a glass jar (a la Futurama style). Yep, you read that right. Now the main thing to take from this is “romantic” and this is actually the most definitive element to the story. There was never going to be physical violence (maybe some face slapping) and all conflict rolls were going to be rolled against other lead characters to complicate their aspirations of winning Kirk’s affections and wearing down his Stamina until he could no longer resist one of the competitors. Oh, and those competitors included Kirk’s gorn ex-wife, a pure energy being, a cyborg who thought it was still human, a vulcan going through the full effects of pon farr, a half-Ferengi bartender with a drinking problem, and the Klingon director of this show (titled “Where No Man Has Gone Before”) calling the shots from behind the camera. Feel free to take a moment and read over that last paragraph again. I’ll wait. How did it work out? Incredibly well. Aside from the numerous laughs and rounds of applause (especially after the half-Ferengi decided to create a wormhole into a parallel dimension and bring back young Kirk – AKA Chris Pine – as a means of cheating and causing a tie in the competition), the game managed to keep this madness together and flowing. While I’ll admit there were moments when the rules were tossed out the window for the sake of brevity, I’m rather proud that what may be the best attempts to break it only helped make it stronger. Now if this is your first impression of ScreenPlay, rest assured this is not par for the course. Yet the fact that it is possible and could become the norm for your own group should they wish it to be gives this game a much needed confidence boost. And me too.